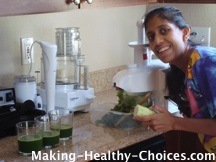 Drinking green juice is an amazing way to add health and vitality to your life. Dark green leafy vegetables have an abundance of nutrients in them, everything from iron to protein to vitamin C.
The juice is made by putting dark green leafy vegetables through a juicer. Other vegetables and fruits can be added for taste (see below list for ideas). When making a juice an abundance of leafy vegetables are used, much more than would normally be eaten in a meal. This allows the body to intake a supplemental dose of nutrients from the freshly made juice and because the fiber has been removed these nutrients are extremely bio-available to your body. 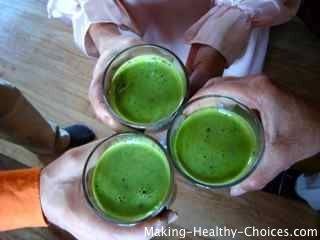 It is important to drink green drinks like this on an empty stomach so that the absorption of nutrients is not hindered. The best time of day to have your juice is in the morning before eating anything else. During our recent 10 day juice feast we drank several of these green juices a day. Of course, it is also important to consume plant fiber so do ensure that your diet also contains whole vegetables, green smoothies and salads. The fiber that is left over after making your juices can be used to make vegetable flax crackers, added to soups or used as a nourishing face scrub*. Use a variety of greens in your juices and continually rotate the greens you use in order to get a variety of nutrients into your body. It is best to buy your greens organic and local, check your area for local Farmers' Markets or co-ops. Even better is to grow your greens yourself. Be creative with your juices but always make the main ingredient dark green leafy vegetables. Use the vegetables that are in season and be imaginative by using a blend of different vegetables every day. Experiment with vegetables that you have not tried before. 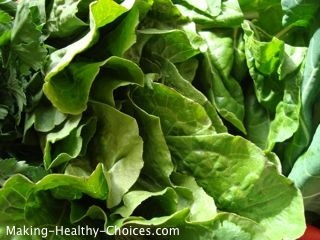 There are so many different kinds of leafy vegetables out there and they all have their own unique taste. Have fun trying them all and juicing them in all sorts of different combinations. If you are not used to green drinks they may taste bitter to you at first. Adding cucumber, red bell peppers or a small amount of green apple, carrot or beet will mask that bitterness and create a delicious easy to drink green juice. 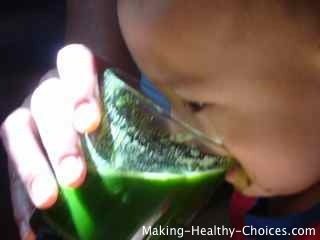 This is a great tip when making green juices for children. NOTE: be sure that most of your green juice is made up of green leafy vegetables. If adding anything in for sweetness (apple, pear, carrot, beet, etc.) this is only added in a very small amount. You do not want your green juices to taste sweet. Why Can't I Make my Green Juice Sweet? Green juice has all of the fiber removed from it, thus creating a juice not a smoothie. Because there is no fiber, the juice and all of the nutrients within are extremely bio-available to your cells. This means that the nutrients can very quickly and easily get absorbed into your body (especially when you drink your green juice on an empty stomach). 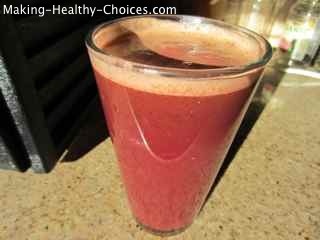 Juicing sweeter things like fruit, carrots and beets will create a juice that is very sweet but because there is no longer any fiber once it has been juiced, the sugars get absorbed far too quickly into your bloodstream. These sweeter foods are wonderful to eat in their whole form (i.e. in green smoothies or other dishes) because in that way all of their fiber is intact and there to slow down the release of sugar into your system. So, when juicing keep it all or mostly green. 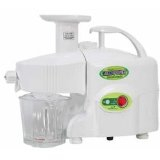 The juicer that I use is a twin gear Kempo Green Power Juicer that I have had for over a decade. Other good brands are the Green Star and Champion juicers. These juicers can be expensive but, in my opinion, they are worth every penny. If you don't have a juicer you can make your green juice with a blender. Blend your vegetables in the blender with some water and then strain the juice through a nut milk bag to remove the fiber. I use a Vitamix Blender but any good blender will do. Here is a short list of produce to use in your juices (add to this list anything that looks good to you). For best results use organic, local and in season produce. 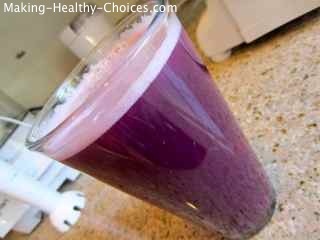 Adding beets (above left) or purple cabbage (above right) will turn your green juice magically into beautiful shades of colour. Experiment with flavours and colours as you rotate your veggies to have new juices every week. There will be those times when, for one reason or another, you will not have access to fresh greens. During my many travels this was often the case (there are many tips to eating healthy while traveling). And there is no need to go without your green juice. A freshly made green juice is always the best but when that is not possible using a superfood green powder is a good substitute. Make sure to only use a very high quality green powder that is sourced completely from whole foods. For my recommended green powder - Vitamineral Green, click here. I make a fresh green juice almost every morning. From start to finish it usually takes me about 20 minutes, during which time I usually have an uplifting audio book playing in the background. A great way to be doing two things at once to start the day off on a healthy note. *Another neat thing you can do while cleaning up is to use a little of the pulp as a face scrub. Rub the pulp on your face after you make your juice and then rinse off with warm water after you are finished cleaning up. This is a great way to cleanse your face and feed it nutrients at the same time. Your skin will be left soft and glowingly healthy. A green juice is an amazing way to start your day. It will help to cleanse and alkalize your system, it will feed your body nutrients in the most easily absorbable form and it will set you up for a day full of energy. Your body deserves it and you are worth it!